Chinese New Year - The Unhappy Duck | Viva! Chinese New Year or Spring Festival is the longest traditional Chinese holiday and is often referred to as the 'Lunar New Year'. Traditionally, the festival will begin on the first day of the first month of the Chinese calendar. It will end on a day called the 'Lantern Festival' which is the 15th and has been celebrated for centuries. It is tradition for families to gather on Chinese New Year's Eve and to enjoy in a meal that will typically include chicken, fish and duck. 'Crispy duck' is one of the nation's favourite dishes but sadly these water birds have never seen a pond. Over 18 million ducks are slaughtered in the UK every year and over 90 per cent are factory farmed - thousands crammed into each shed. Birds who have evolved to eat, swim, dive, clean and play in water - never even see it except to drink. Without water, their lives have little meaning. They can't preen or clean properly and often develop eye problems that can end in blindness. Mostly descended from wild Mallards, farmed ducks retain their wild instincts yet never go outside, never feel the sun on their backs or experience the wonderful freedom of an open river. The only time they leave the shed is to be barbarically slaughtered at just seven weeks old. Factory farming is a disaster for animals but doesn't do us much good, either. 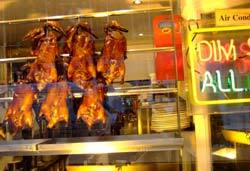 It's an irony that many traditional Chinese dishes are vegetarian and low in fat - 'crispy duck' is neither. In fact, it can be packed with as much fat as a deep-fried Mars bar! Also difficult to stomach is the fact that most food poisoning comes from meat and other animal products. Just as scary - the widespread use of antibiotics on factory farms has contributed to antibiotic-resistant food poisoning bugs such as Salmonella and E.coli and helped to produce deadly superbugs. Find out more about Viva! 's campaigns to end duck cruelty. Don't contribute to duck cruelty. There are plenty of delicious vegan alternatives you can try. Click here for recipes.